The Wesak Full Moon occurring on May 14 in Buddhist culture is a celebration of the birth of Buddha, as well as his enlightenment and death. 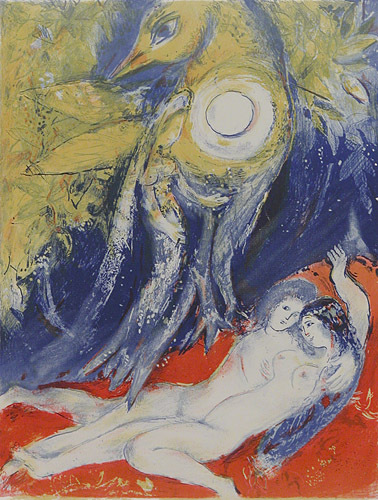 The connection between Wesak and the Full Moon that occurs when the Sun is in Taurus and the Moon is opposite in Scorpio is evident through the lens of esoteric astrology, a system in which Taurus, Scorpio, and the Moon are all associated with the 4th Ray and the crises of experience and consciousness we experience as a result of being incarnated in a human body. Alan Oken has taught that the 4th Ray is known as “the art of living,” a ray connected to the “fourth plane of Buddhi” and an “Intuition” developed through hard won growth in the face of conflicts that polarize and contrast our “lower” and “higher” nature (Oken, 120). 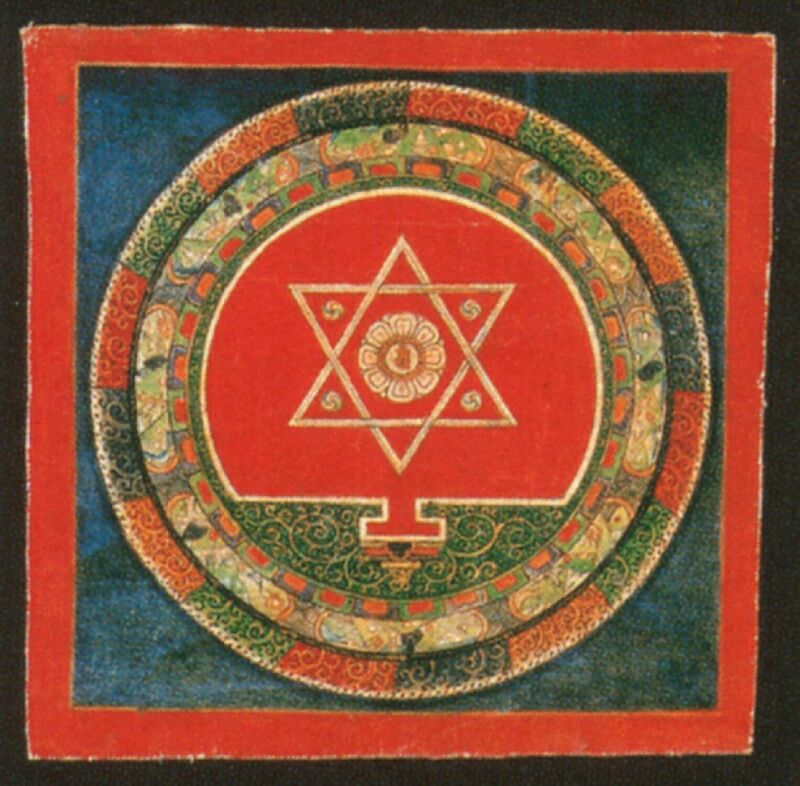 Just as in the double tetrahedron image above, also commonly known as a “Star of David,” in the center, in the heart, we can integrate the essence of the contrasting movements of the lower to the higher, and the higher to the lower (similar to how the 4th chakra, the heart chakra, integrates the energy from the three lower and the three higher chakras). From the soul-centered perspective, this integration also connects to the alignment of the personality with the soul and the wisdom gained to help us discern a path forward to devote ourselves toward. In the life of the Buddha, we see an individual facing one crisis after another involving his human form and desires, creating new forms of belief and existence to live from only to destroy them in order to create another form anew. As a result of experiencing many material and spiritual crises, however, Buddha was able to integrate the wisdom he found in his experience in order to reach enlightenment. Every Full Moon shines it’s light on our path forward and what forms we have created to anchor and express our purpose in the world, as the Sun in astrology is connected to our soul purpose, and the Moon in astrology is connected to our personality, the human form and vehicle of our soul purpose. Along these lines, during times in which the forms we have created in our lives align harmoniously with our soul purpose, we often experience a blissful sense of euphoria at times of a Full Moon. In contrast, during times in which the forms we have created and are living from in our daily life do not adequately align with our soul purpose, we dramatically realize what feels wrong about our life, where it seems we have failed or where we feel a loss of meaning because of the discrepancy between our soul purpose and the forms our personality has been living from in our life. When Mars’ passion becomes conscious it flings itself, eagle-like, to the source of life and light; or else, frightened, it collapses into meaninglessness and ravenous hunger for the products of death. The sun is so low in late autumn that the eagle may tear from it sparks of divinity; but will the wings collapse burnt by the fire, or will they become translucent poems chanted to the rhythm of light? Will they stir men that are but human into seekers of the star that is their apocalyptic self? Scorpio is the eternal question tearing at the core of all roots under autumnal skies. Will it be death; will it be rebirth? On the one hand, this Taurus – Scorpio Full Moon illuminates our past process leading to now, including our recent experiences with the Cardinal Cross that occurred in April, as Venus is exactly square Pluto and entering into a conjunction with Uranus at the time of the lunation. On the other hand, this Full Moon also illuminates the future we enter in every moment, including the next big astrological alignment: the Grand Water Trine of Saturn retrograde in Scorpio, Jupiter in Cancer, and Chiron in Pisces. In addition, one can see above that the true node of Black Moon Lilith is also involved in this Grand Water Trine at the time of the Full Moon, being conjunct Jupiter in Cancer. Since this Full Moon is conjunct Saturn, and the Sun at this time is opposite Saturn, however, it will be beneficial to integrate those qualities that please Saturn, such as discipline, persistence, diligence, organization, structure, and the creation of necessary, appropriate boundaries. Although Jupiter and Chiron are culminating into an exact trine at this time, it will be another week or so before Chiron and Jupiter reach exact trines with Saturn. In totality, these harmonious aspects bring a potential for structured expansion closely aligned with our authentic nature and desires linked to our soul purpose, as long as we choose to heroically face down our fears and courageously open ourselves to the universe enfolding ahead of us, despite past wounding that tends to keep us limited to a comfort zone of the status quo. It is very possible that fears and anxieties arising at this time are directly connected to our process of realizing our authentic nature; it is only through owning these scars and wounds, unashamedly stepping forward on our path, that we will be able to release ourselves from the grip of our past and open ourselves to the future to come that is more closely bound to our soul purpose. Saturn retrograde in Scorpio also does not expect us to quickly overcome these past patterns, but rather has a plodding fixed quality that allows us to take our time as longs as we remain steadfastly dedicated to resurrecting our authentic self from the past wounds that have oppressed our full expression. In the past three and a half months we have traversed a chaotic Mars retrograde transit that took us through the Cardinal Cross alignment, an exact square between Uranus and Pluto, and two eclipses. At the time of this Full Moon, Mercury moving fast in Gemini will be separating away from an exact trine with the red planet, an aspect that in combination with the Scorpio Full Moon can help us reflect upon and integrate our experiences since the beginning of March that have correlated with the Mars retrograde phase. 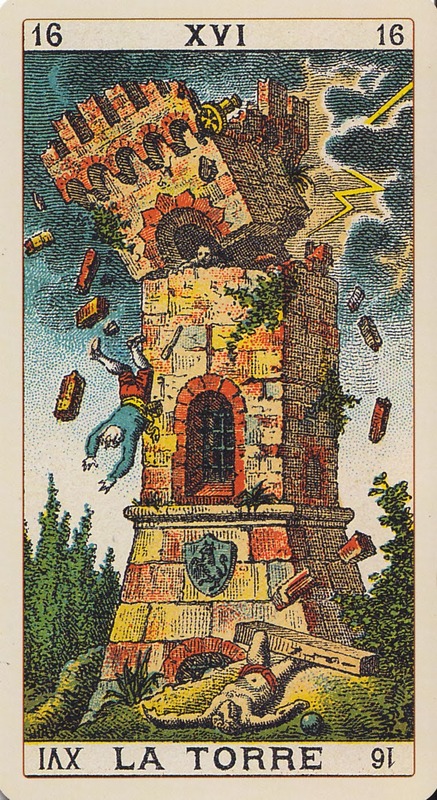 In connection with the XVI Tower arcanum image above, dramatic change will occur in line with Mars stationing direct, change that could feel unsettling or devastating; yet, in the process a huge amount of energy will be made available, energy released through the destruction of past form. Open yourself at this Full Moon to sense what changes are underway in your life, and where you need to take action. In this next week following the Full Moon, as Mars finally stations direct on May 19, you will want to be prepared to shift from a mode of inner reflection about what actions to take into an active process of making decisive choices to move forward on the path that calls to you. Mars is also continuing its intense dance with Venus in mutual reception, as Mars is in the sign of Venus and Venus is in the sign of Mars, moving away from an exact opposition a few days ago. Venus and Mars at their opposition point, with Mars stationing direct in Libra, and Venus moving direct in Aries, emphasizes listening in the evolutionary astrology paradigm taught by Jeffrey Wolf Green. At this time we are called to strike a balance between focusing on the willful assertion of our unique values and vision (Venus in Aries) and listening to the needs and values of others we are in relationship with (Mars in Libra). In this process, we will also need to utilize Saturn in Scorpio to help us create boundaries in our relationships that protect our authentic nature from manipulation from others, while interacting and at times merging resources with others in the world around us. Through the recent waxing gibbous phase between Venus and Mars retrograde, we have had the opportunity to utilize the retrograde Mars energy to inwardly adjust how our soul relates to itself and others. We can now reap the benefit of this inward adjustment by learning to relate to others as an equal in relationship, learning how to give, and to receive what the soul needs through the giving. Through this process, we will likewise be learning how to integrate our specific soul values, needs, and desires into society and our surrounding social reality. We will benefit from cultivating an ability to truly listen to others, because as a result we will be able to give to others what they truly need, instead of what we think that they need. Yet, with Venus in Aries this means maintaining boundaries to support our own well-being and sustain connection with our unique self, in order to not lose touch with our authenticity through our interactions with others. It is important to remember that truly listening to others, learning to give what others truly need, does not make us a push-over but rather allows us to create truly mutually beneficial relationships with others. Venus in Aries can get upset when it does not get its way, while Mars in Libra is more likely to be offensively charming in order to ensure that it gets its way. In contrast, we can use the polarity between these personal planets to destroy our attachment to getting our way or arguing to come out on top, instead standing strong in our self while truly listening to the values and views of others without feeling competitive or threatened if their views are not only different from ours, but critical of our own views. Instead, through listening to others we may hear a new perspective to help shift our own perspective into greater alignment with our soul purpose, a missing piece to not only our own puzzle, but a universal one. Out of the cubic Stone of matter, differentiated into a myriad of crystalline structures, the flowing curves of living bodies take form. They open themselves to the power of light, carrying within its compassionate song the promise of individual existence. Venus, builder of magnetic fields that capture the electrical impulses of the creative spirit, brings to a focus the promise of wholeness, of fulfillment in love – a love that forever sings of the overcoming of pain and crucifixion. The “cross” of this “crucifixion” symbolically connects not only to the recent Cardinal Cross alignment in astrology, but also to the 4th Ray nature of the Taurus – Scorpio polarity of the current Full Moon. 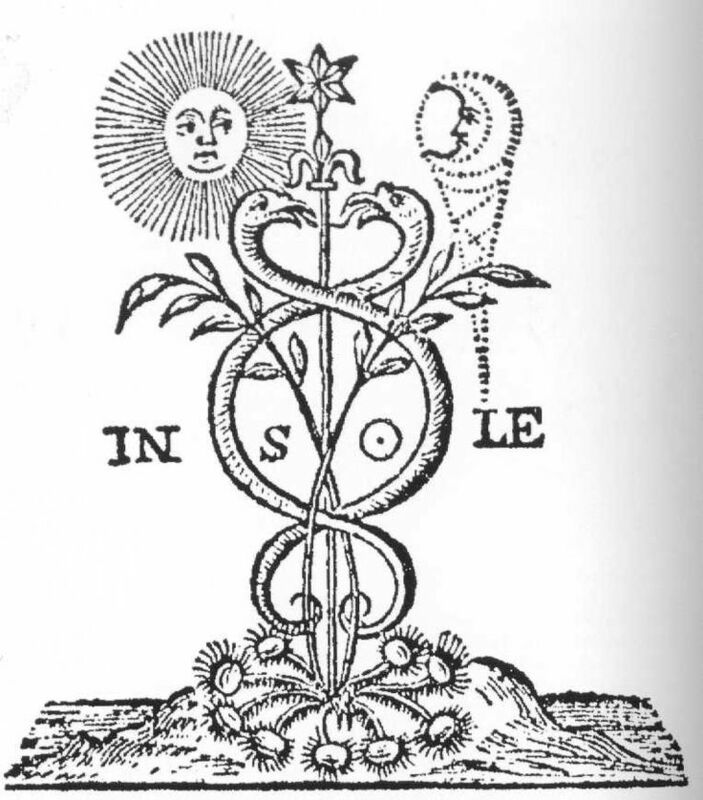 Any cross has a meeting in the center, the core, or the heart: and so, no matter how many obstacles appear to be surrounding us in our environment, the electrifying union of Venus and Uranus in Aries at this time has the power to burn through obstructions in our outer and inner experience. Out of the flames of this destruction, a more fully realized sense of self may emerge. 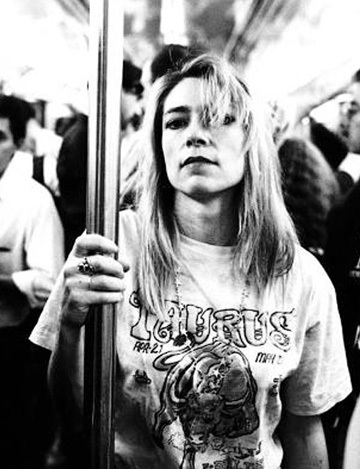 A strong embodiment to me of Taurus solar energy combined with a Venus in Aries marked by Uranus is the artist Kim Gordon (pictured below). Through her work in past avant garde bands like Sonic Youth and current ones like Body/Head, Kim remained dedicated to her own vision of art and music with the personal integrity to take strong stands against the status quo and in support of feminism and segments of society lacking an equal voice, creating a unique form of music that deconstructed past patterns of rock and roll. By staying dedicated to her personal values, across time Kim was able to integrate her work deeper into mainstream society and influence multitudes of youth across international boundaries and borders. Indeed, at the age of sixty-one, Kim recently rocked at least as hard as any much younger rock star when she fronted the remaining members of Nirvana at their induction into the Rock and Roll Hall of Fame, singing and screaming the song, “Aneurysm” (you can find this online). Look for the movement from the location of 10 degrees to 28 degrees of Aries in your chart to see where Venus is transiting during the above series of aspects. Working with Venus at this time toward the issues connecting with the house she is moving across in your chart can result in tremendous growth for you in the associated areas of your life. Indeed, as Venus moves away from her opposition with Mars, she makes the most powerful aspects to a series of pivotal planets, asteroids, and outer celestial bodies in roughly a week, to be followed a few days later by a union with the South Node of the Moon. Venus is taking us into the heart of the matter, our core patterns and issues, and in Aries she will be one demanding goddess. Venus wants nothing less of us than to face our fears, release our attachment to vengeance and past betrayals, and to boldly step forward into a Grand Water Trine as Mars finally stations direct to move forward again. In addition to being the Wesak Full Moon, this time is also a Lunar Beltane, the Full Moon of the Full Season (Spring or Autumn, depending upon your hemisphere). This traditional pagan holiday connects with the past pagan holiday of Candlemas on January 31, when Venus stationed direct conjunct Pluto. The exact beginning of the current Venus and Pluto cycle began in November 2013, but the New Moon that occurred on Candlemas with them closely conjunct after a long Venus retrograde cycle is an important moment in time to return to in reflection now. What has transpired since then? At the time of this Full Moon we have finally reached the first quarter square aspect between Venus and Pluto, all the more electric and shocking to our system with a conjunction between Venus and Uranus. No matter what obstacles appear to be in our way at this time, know that this is not a time to back down in fear but instead to live in passion from our heart, in alignment with our authenticity. If we are on our path, and truly listening to others in our environment, no doubt we can also create some new alliances and friendships at this time to help propel us further into our soul purpose. Taking it all to heart. Feel it in your bones. Listen with your heart. Feel it in your soul. Know your truth. Walk your truth. Next week as Venus aligns first with Eris and then the South Node of the Moon in Aries, we will experience an exact disseminating trine between Jupiter in Cancer and Saturn in Scorpio. As a result, at this time we are entering a Grand Water Trine involving Jupiter, Saturn, and Chiron, and so to get the most out of this we want to be on our path and focused on the beloved desires of our soul. Keep in mind that a Grand Water Trine can cause emotional swirling – this can be like a blissful, adventurous float down a river, a lazy day getting burned by the sun lake-side, or more like the experience of a tumultuous typhoon. No doubt there will be stress and sources of potential fear emerging around us, given the nature of recent astrological and world events. Yet if we can focus on what we truly want to manifest, what strikes us to the core of our soul and being, we could end up in the arms of our true beloved sooner than we may realize. Rudhyar, Dane. (1976). 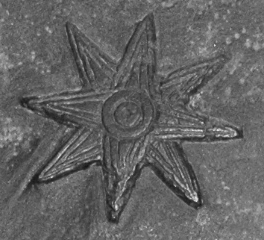 Zodiacal Signatures. Stellar Energy Exchange. Reblogged this on The Soul of the Rose. 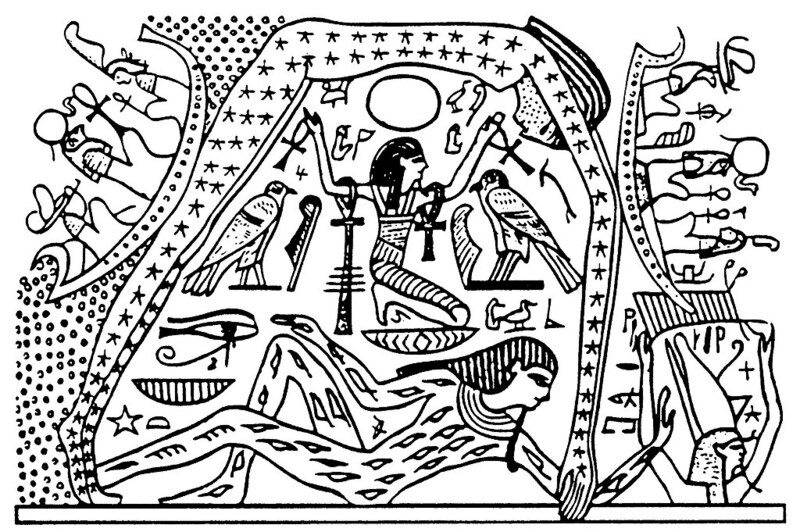 I have just googled Rudhyar’s Zodiac signatures and have found his sketches of rhe Zodiac signs. They are really beautiful, aren’t they? Having read a few of his books, I have never come across such beautiful quotes that you have found, which really show off his writing in full bloom. Yes, very beautiful. I think it is a special book by Rudhyar, one I had never seen before combining drawings he made when younger with writing from an older perspective. I found it in Magus Books, a used book store in the University of Washington district of Seattle recently, a wonderful book store where you can find special used books. Thank you again for your compliments on my writing. Thank you for sharing the whole picture, and so elegantly and profoundly, as always! As well as giving me personally some truly great, apt affirmations. My first house and seventh house are at the emphasis here, with a very special mirror. By the way – one way to deal with the Scorpio transformation (being a Scorpio myself) instead of needing to go all way the to “destruction” and deepest drama is to recognize the need for transformation, renewal inside. It is “just” that (in many cases, never speaking of absolutes). The unconscious drive for outer world chaos has left my personal life since several years ago (though there is some inner shaking left still, but…:D I was born and grew up in the middle of deep drama). I can say that I have also experienced miracles on my way. And of course there are other factors in work here as well, but just sharing as an affirmation to anyone possibly needing one. Relating to astrology I´m also observing how with the new energies (being an “energy anchor” myself) we are able to transcend the old astrological energies (or ways of coping with them, and so on). That to me personally means to have a detached enough view when looking at the astros not to create what is not necessary to be there anymore (if that now makes any sense). Symbolically the asteroids play a higher, more gentle octave to me. Thank you for your compliments and blessings. I agree with you about the asteroids: while there is more than enough to learn from only focusing on the usual seven or nine astrological suspects, there is incredible additional information found in the asteroids that continues to amaze me. I also agree with you about how things can shift across time, and it is one reason i like the categorization of “archetypes” because by definition archetypes are not stable, fixed concepts but rather ever evolving. I do find it interesting to look back through history at ancient perspectives concerning the astrological archetypes, but I also recognize that astrology just like everything else creative in nature is always changing in some ways. In totality, these harmonious aspects bring a potential for structured expansion closely aligned with our authentic nature and desires linked to our soul purpose, as long as we choose to heroically face down our fears and courageously open ourselves to the universe enfolding ahead of us, despite past wounding that tends to keep us limited to a comfort zone of the status quo. It is very possible that fears and anxieties arising at this time are directly connected to our process of realizing our authentic nature; it is only through owning these scars and wounds, unashamedly stepping forward on our path, that we will be able to release ourselves from the grip of our past and open ourselves to the future to come that is more closely bound to our soul purpose. You have no idea how closely these words resonate with my present inner journey. I love your interpretation here and it validates that my focus is ” right on time”. With my Scorpio stellium in play and Uranus my chart ruler opposing Chiron at 25 Leo. 27 Aquarius respectively, there is plenty on my plate. 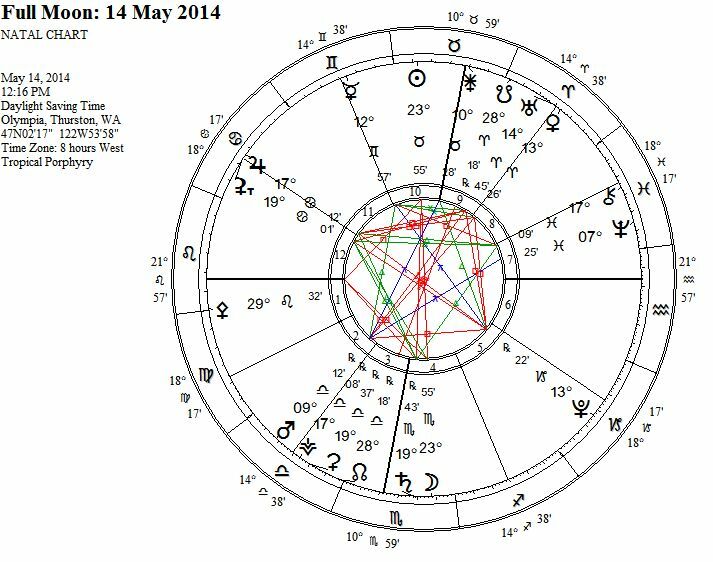 Add my Saturn Mars opposition at 13 Cap/ 17 Cancer, one could say that my natal chart has been lit up like a grandiosely decorated Christmas Tree! Thankfully Jupiter is conjunct my Mars today adding more presence to the grand trine, gently nudging me along my path. Thank you for such a rich and intricate offering Gray. Thank you Linda, and it does indeed sound like you have a lot going on! I hope you are enjoying Jupiter. Savor having that Jupiter on your Mars! Saturn has been in a full force in Scorp since last year as we know it…Trining natal Mars 19 Cancer as oppose to Saturn opposition Mars in my natal chart needless to say I am grateful that Saturn is enlightening his lessons in a harmonious way! I have planted a seed in my art business last year and the seed is about to flourish in to the next level. Not only that, I am becoming Saturn himself,,,,Progressed Sun, Mercury, Jupiter at 14 degree Capricorn next the to the God himself aka Saturn at 20 degree Cap, I am becoming a sold rock! My ruler is Transiting by that zone is another blessing! T Saturn aiding with Full Moon together illuminating my soul purpose wide eyed , in close relationships superficiality is being forced to be eliminated without disturbing my values in universal love……although I haven’t lost the sense of humor, my intuition as well as focus developing tremendous. Life travels fast in a light speed but having fixed angles in natal chart, I am slow to bring an idea in to the action, and who is better than Saturn who teaches me it’s ok as long as you take a step the second will follow. That is my joy to your writings, it speaks to me clearly …..so much blessings to you and your journey …….Happy Wesak Night 2014! Thank you for your compliments and your blessings. It does sound like you are making good friends with Saturn, and sounds like Saturn will be rewarding you for it. nor discounted for quick profit on the popular market. fancy tales for a shilling. Skillfully fade; still outside of jail. advised never expect a binding code. ‘cause it’s all we know. Tomorrow is only a threat. Tonite is the moment we met. To live by chance of regret could do us wrong. Listen to me. I’m a song. madness, empathy, a symphony, a cure for anything. to keep us all at the top of our form. vowed to fly us to our highest goal. Taste bittersweet long accumulated heritage. skeletons deconstructed to reclaim from waste. carry potential energy into archaic deserts. Sleep well in comfort of serene will. Thank you. I like your imagery of ever re-emerging in bloom.